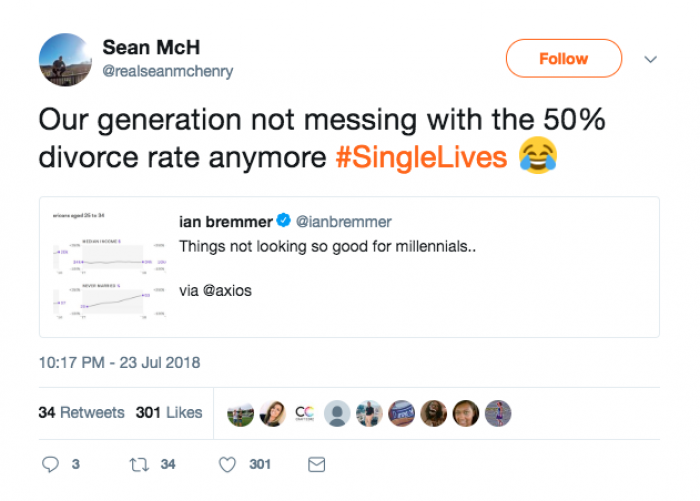 Millennials get a pretty bad rap for being selfish, spoiled, and just plain out of control. 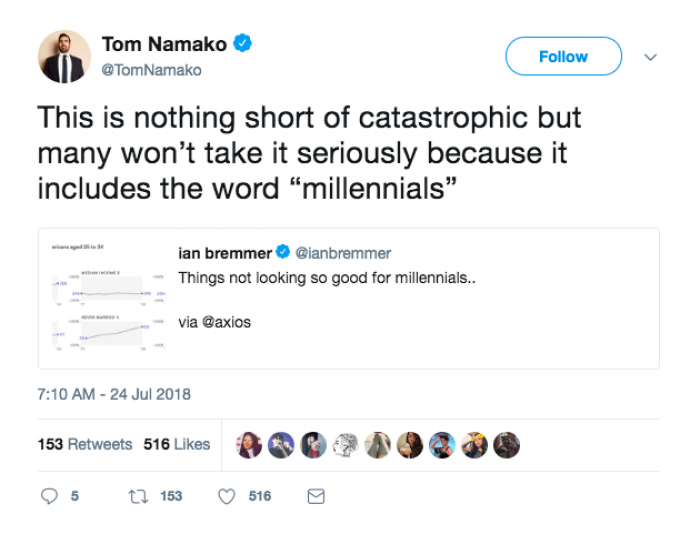 While I'm sure there are a number of selfish, spoiled, and out of control millennials out there, I don't necessarily think its fair to lump us all into one category. When it comes to life in 2018, there are a large number of things that have changed since our parents and grandparents were our age. Millennials often argue that previous generations had much better opportunities and were set up for success much more than we were. 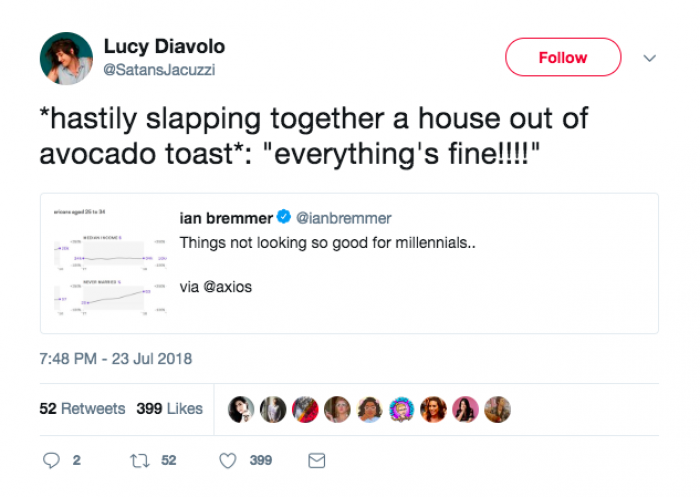 While previous generations will argue this until they are blue in the face, there is now actually scientific proof that millennials do, in fact, have it harder. The study was conducted by Axios and they reflect that although the median income hasn't changed whatsoever since 1977, the cost of living has continued to rise over time regardless. 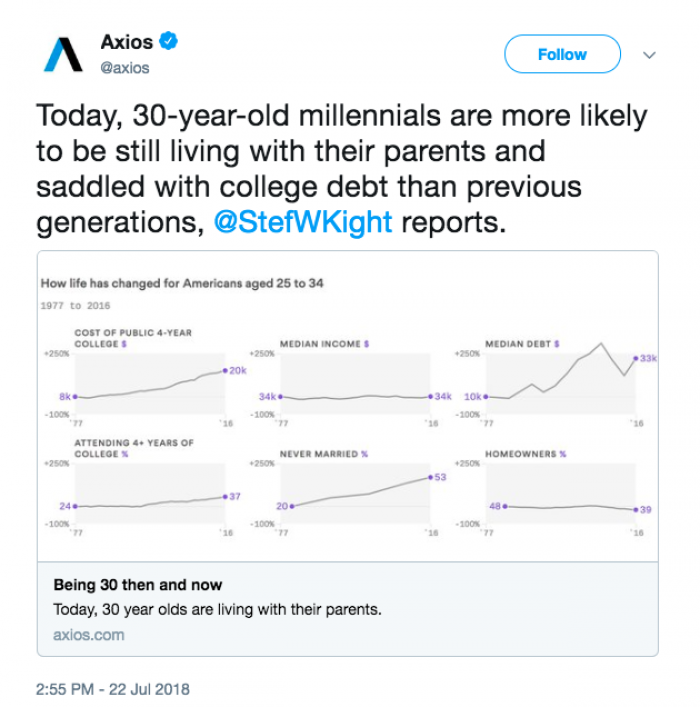 In fact, Axios found that 30-year-old individuals, today more so than ever before, are more likely to be smothered by student loan debt and have no other choice than to live at home with their parents. So what this whole thing boils down to, in the simplest of terms, is the fact that millennials are better educated than any generation before them but make much less money and are in an astonishing amount of debt and financial struggles. Fewer of us are getting married and the birth rate, overall, is dropping significantly as a direct result of this. And rightfully so. Anything to numb the pain right? Here's a plus side to all of this news- millennials make up at least 25% of America's voters so they definitely have the opportunity to evoke major change. So millennials, do your research and vote accordingly! Your future depends on it!